Three dollar bill issued by Merchants & Planters Bank. 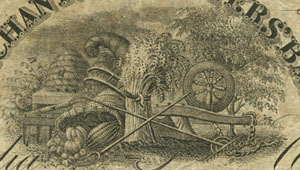 Detail of a three dollar bill issued by Merchants & Planters Bank. The first printed currency in the American colonies was issued in Massachusetts, on the 10th of December, 1690. During the years leading up to the American Revolution, there were so many different currencies, issued by the various colonies, that it was sometimes difficult to transact business. The Continental Congress decided in May 1775 to issue paper money to finance the war. 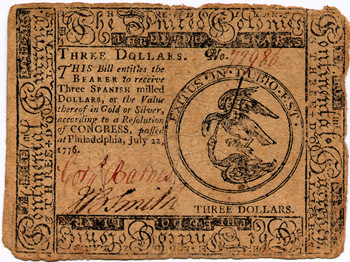 More and more ‘Continentals’ flowed into circulation as the war progressed, and people realized that Congress could not possibly redeem them in Spanish dollars, gold, or silver. This loss of confidence brought rapid declines in the purchasing power of Continental currency. “Not worth a Continental” became a commonplace saying. 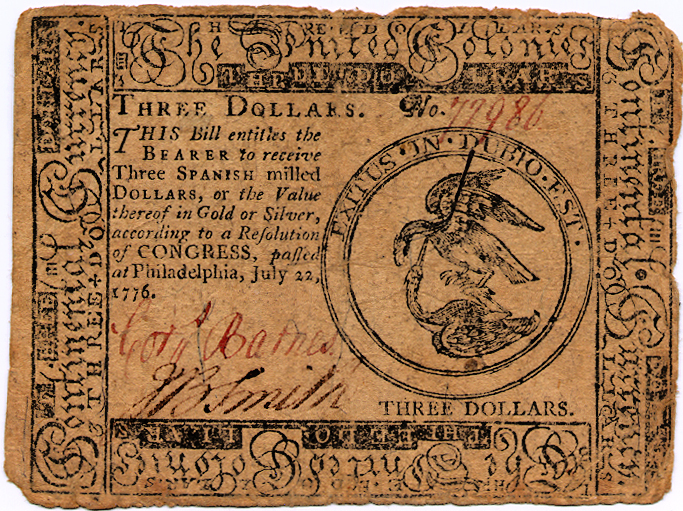 After the Declaration of Independence severed the colonies’ ties to Britain, Congress authorized paper currency to be issued by the “United Colonies.” This image is of a Three-Dollar bill, issued just a few weeks following the Declaration vote. Information, web sites of the Federal Reserve Bank of Richmond and Notre Dame University.